The Friends of Memorial Park extend their appreciation to the almost 40 volunteers who gave two hours of their time on the first sunny Sunday we’ve had in some time to help with our fifth annual Earth Day clean-up at the park on Sunday, May 4. You inspire us to work in the community to create new and practical ways to lessen our environmental footprint and improve the health of this amazing green space. You validate our perception that many people want to contribute in concrete ways to improve and protect the environmental health of our community. In very practical terms, your volunteer efforts help to protect the most valuable green asset of the municipality: Memorial Park (revenue generator). 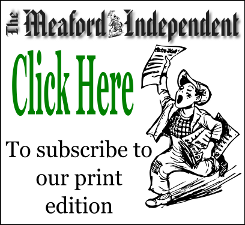 To our sponsor, The Meaford Independent, we take your ‘Every Week Should be Earth Week’ editorial to heart; thank you for being there over the past 5 years. The afternoon was fun; the company superb. The three issues that you reference in your editorial are all issues that the Meaford Area Community Association (MACA) has been very much involved in. For those that may have the impression that we are a NIMBY (Not in my back yard) group, I will go on to explain why we are not. Members of MACA have been very involved in the Industrial Wind Turbine (IWT) issue, from the beginning, and continue to be involved in it today. It is not the fact that we don’t want IWTs in the municipality; it is that we really don’t want them anywhere. After doing much research on IWTs you will find that they are harming people (as they are no longer able to live in their houses due to the health issues that they cause), harming the environment (many birds and bats are being killed by them), and harming the economy (as the hydro rates in Ontario have skyrocketed, causing many industries to downsize or leave, as well as decreasing the disposable income of all Ontarians).